I don't pretend to like the man who is my state governor. He essentially won because of name recognition and ignorant rural people who like his small Kansas town values (even though he hasn't "lived" in Kansas in nearly twenty years). Well, Governor Brownback clearly isn't in office to make friends, at least friends who have differing opinions than him. One of Brownback's staff members called up the principal at Shawnee Mission East High School in Prairie Village to complain that one of their students, who was visiting the Capitol in Topeka, tweeted a disparaging comment about Governor Brownback. The tweet? The principal then called the student, a girl named Emma Sullivan, into his office and said it was unacceptable and an embarrassment. The school and the governor's office is asking that Sullivan apologize. Sullivan is not sure if she will. Governor Brownback's spokesperson, Sherriene Jones-Sontag, stated “That wasn’t respectful. In order to really have a constructive dialogue, there has to be mutual respect." Which brings me to the point of this post: When was the last time Governor Brownback, or any Republican, showed President Obama any respect? I've always been told that if you don't respect the person, at least respect the office. Barack Obama is our President. Our Commander-in-Chief and it bothers me that when a Republican was President, any disparaging remark was unAmerican and, from the way Fox News took it, an act of treason. It's not unAmerican. It's not an act of treason. And, to a point, it's not disrespectful. Living in the United States means that we can say what we want about our elected officials (as long as it's not a threat, libel or slander) and the government (Federal, State, local) can't do anything about it. In some countries, making a remark like that would result in, best case scenario, disappearance. 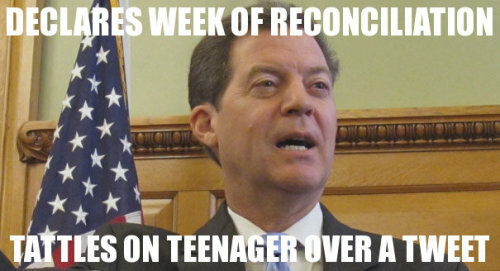 Why couldn't Brownback, or at least his social media monitoring team, just keep quiet? I want to think, since Sullivan was there during a Youth in Government meeting, that was the main reason. A preemptive "this girl doesn't think like us so we don't want her in politics" strike. Sullivan decided not to apologize, stating that it wouldn't be sincere and I agree. It would be like a teacher forcing two second graders to apologize after pushing each other off the slide. It wouldn't be sincere and they are just doing it to keep from getting in more trouble. Brownback offered a statement late Monday morning apologizing for his staff over-reacting to the tweet. Why he didn't make a statement Friday just so the story wouldn't have time to simmer over the weekend is beyond me but now we can move on to more important matters.